Our Color Your Own Posters are a great way to get children involved and learning during Mass, class and religious education gatherings. Each poster comes with our exclusively designed artwork and editorial. Finished posters also make great classroom decorations or kids can take them home and display them in their room. 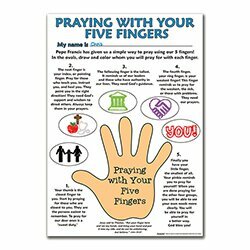 The Five Finger Prayer was created by Pope Francis and uses each finger to represent a type of prayer. It is a powerful way to teach children to pray as they fill in the fun facts and color their finished work.